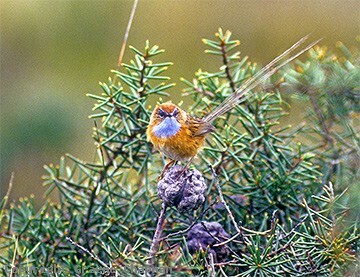 Southern Emu-wrens inhabit dense low-growing heathlands around southern Australia and Tasmania from near Fraser Island in Qld around to Dirk Hartog Islnd in W.A. where there is a distinct isolated subspecies. They are extremely shy little birds and spend much of their time feeding low down in the dense shrub layer, close to the ground but only occasionally on it. Little detailed information about their life history is known. They appear to live as pairs or small family groups in permanent territories. 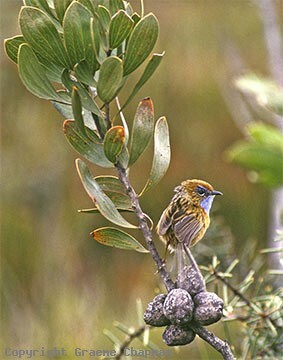 526201 ... Southern Emu-wren, male, Green Cape, NSW. 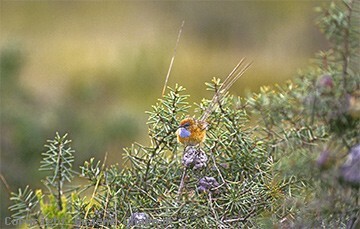 526203 ... Southern Emu-wren, male, Green Cape NSW. 526204 ... 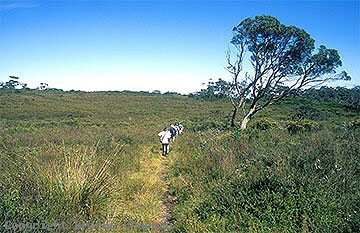 Dense, low heath at Barren Grounds, NSW. where they are plentiful.